When you think of the future, few lists would stretch long enough to include the Commodore hotel at Weston SuperMare. 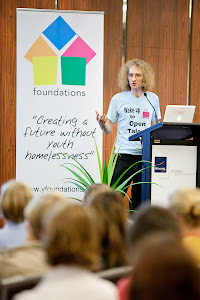 But that’s where I headed on Thursday afternoon, ready to inspire the staff of 'Futures at Knightstone' with Open Talent. It was an inauspicious start. I had arrived at the Commodore hotel for a pre meet with senior staff, only to be greeted by a keyboard player singing a dubious version of Elvis’s ‘Always on my mind’. It was hard to tell if he was on the mind of his ageing audience, half asleep in the corner. A few looked up over their coffee cups to wonder if I was the next act. According to the posters, that privilege belonged to Ann Widdecombe later in March. Whilst I have once or twice been mistaken for John Lennon – despite his well-publicised death – I was clearly no Ann Widdecombe. I hid for a while in my sunny bedroom, watching a chocolate mint melt on top of the bathroom towels where it had been carefully left to wilt in the heat. Thankfully, it wasn’t long until I was rescued. After agreeing details for the conference with the senior staff over a coke in the bar, I slipped out to charge up my advantaged thinking batteries with some friends for the night, creeping back when everyone else was dreaming of grapefruit segments for breakfast. The staff conference brought over 40 people from services across Bristol, Weston, Yeovil, and beyond my shaky geographical grasp of the south west. People smiled and looked enthusiastic, with just the odd grimace making me wonder if I should have asked for the Elvis keyboard as well as the projector. But they, like I, were here for a common purpose; with the same care and commitment to make a change for young people. Open Talent is an easy sale for anyone with a heart and a head, and we had a whole day to read the small print on the deal. Six hours later, after the exercises, discussions and presentations, there was a palpable sense of potential in the room. The staff had created pitches for wonderful project ideas, accentuated the positive in their services, and outlined plans for activities to celebrate, develop and invest in over the next few months. The discussions had challenged and provoked lots of advantaged thinking, and true to form I had been sussed out as the occasional disadvantaged thinker myself. We were all looking forward to June, to present back in public the Open Talent story of what Futures at Knightstone is all about. There had been one decisive moment. Someone had questioned whether, even in an exercise, staff should think of doing things in their own lives to inspire the young people they were professionally responsible for. The post it notes crowded around the wall suggested otherwise, with ideas for swimming with sharks, running marathons, being more confident, and asking young people to set challenges. The day the adults cease to lead lead by example is the day we lose our authenticity. And being authentic is what commitment for young people - what Open Talent - is all about. The room, I’m glad to say, was full of authentic people, prepared to dare themselves. I was driven back to the station by a lovely staff member from a service in Weston, who chatted excitedly about setting up a shop enterprise with young people. ‘It’s about getting on and doing it, not just waiting for it to happen,’ she said. If I had come with a baton, it had been passed on. I fell asleep on the train home, woken only by the ticket collector as the train drifted towards Bristol. ‘Day dreaming?’ he inquired. 'No', I smiled, 'just thinking of the future'.